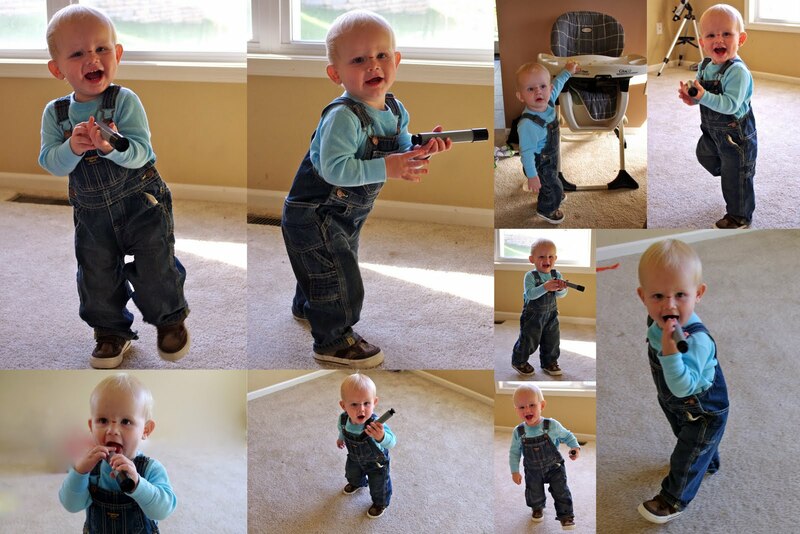 First off, Grayson wore his overalls today for the first time, he just looked too cute in them I had to take a lot of pictures. Second, about 2-3 times a year I clean the boys room. They will usually clean it once a week but never do a full cleaning on it unless I get to it. Its also a good time for me to trash all the broken toys, ripped up books and crumbled papers that they "have" to keep. Today was that day. To my amazement (and glee) I found nothing dead or (and even more thankful) nothing living either. That in and of itself is a success! I painted their room gray about a year ago and its just so boring I've been trying to figure out how to add more color to it. The problem, one side of the room is decorated in K-State and the other in Steelers. They don't share a color other then gray. But I think I can add purple and yellow (maybe stripes?) to it to liven it up a bit. I just can't figure out a plan yet. 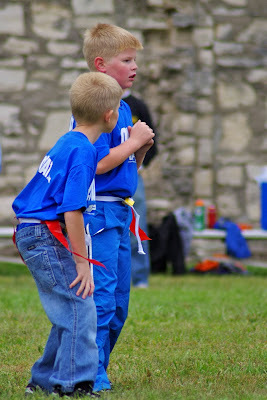 Third, the boys had their third football game. They all played so much better it was really exciting. They still lost but their team actually scored which was a huge deal. Damon was so excited that he caught every pass and he got to play quarterback for a little bit too. Xavier (I think it was him) pulled the flag from another player and stopped him from scoring. So it was a good day for Dolezal football players. Fourth, Aiden is starting to talk a lot more and has been saying the funniest things. And its not so much what he says but how he says it. For instance, if someone upsets his world he will instantly call them bad. And it could be about anything. If I make the wrong turn, "Bad Mom, You bad, you bad Mom." and he will say it over and over until he finally moves on to something else. I recently started saying back, "I'm not bad, you're bad. Bad Aiden." And he will say, "Nooo you bad. You bad Mom." Its awesome when we are in public. When Aiden isn't engrossed in some cartoon, tormenting his brothers, or eating everything in the pantry, he is happily playing on my itouch. He loves Angry Birds but has also started to play a couple of other silly games Damon and Xavier talked me into. One is a ninja game that Aiden is apparently not very good at because every time he plays it I hear, "Oh, Me die!" repeated 10 times. 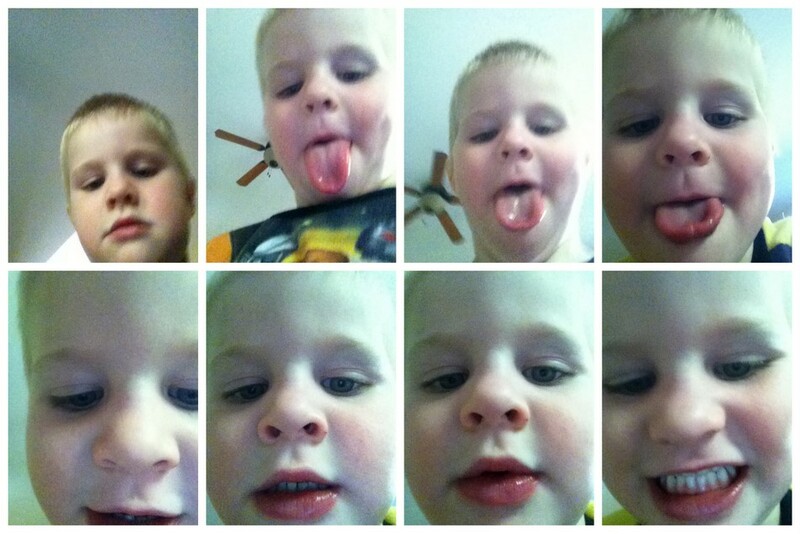 His other love, is taking pictures with the camera. Imagine photos like this times 100. And I'm not exaggerating, it takes a lot of time to delete hundreds of pictures that usually involve your toddlers tongue or a great ceiling picture with one eye in it. Grayson got into a little fight this morning with the treadmill. Guess who lost? I was working out and he crawled on the treadmill with me before I could stop him. He rides it all the way down then hits his head on the bed that is right behind the treadmill. I think it looks worse then what it is. Its just a little line across his nose but he bled pretty good. Thankfully he calmed down really quickly and seemed fine all day. Hopefully he wont be too bruised in the morning. Maybe not.... He was actually really upset because I wouldn't let him play with the camera. He has a thing for technology. The boys participated in a race that is held every year for all the school kids, K-8 grades. Damon and Xavier were in the same race. They ran a half mile. It was a fun little thing, they got t-shirts, medals and snacks. They loved it and had a great time. For some reason we decided to take the boys camping. I think we decided to do it for cub scouts, I'm not sure. If we have met, you know I'm not a camper. But anyway, we headed to the lake and camped with some friends of ours. It was fun to cook hot dogs, eat way too many smores and sit by the fire. I just wish my hair didn't still smell like fire. (Seriously I have showered 3 times since then, washed my hair each time and still smell!) Adam and our big ole tent. Grayson, he actually slept really well. I was worried he would be too cold and struggle staying asleep. But he did great. He did however leak out of his diaper and his wonderful parents didn't bring him any other clothes, so we had to jet in the morning to get him in some dry, warm clothes. Aiden and Xavier were in heaven to be in the dirt. Damon packing up, his friend Eli in the tent. All three boys stayed in this little tent. They were probably the warmest ones. The best part, coming home the next morning and finding that our house wasn't burnt to a crisp. Someone (oops) left a candle burning all night! 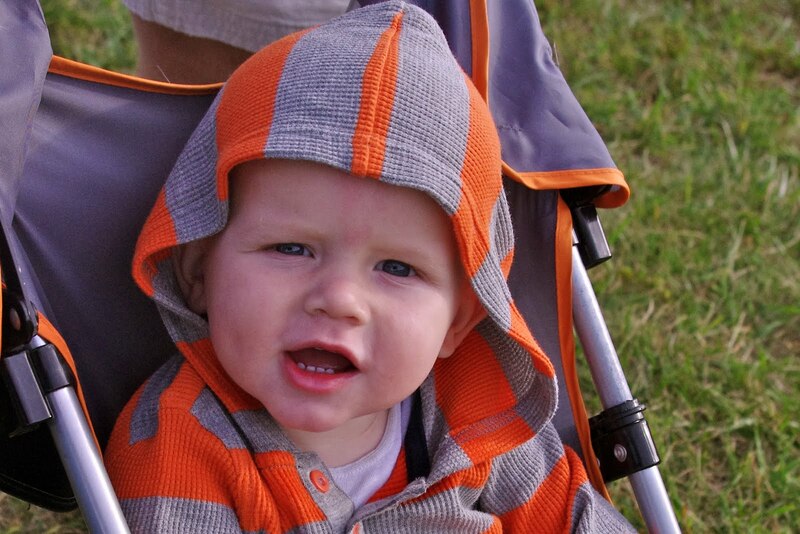 Just some pics of Grayson, playing with his cars and walking at the football games. Nothing exciting, I just thought they were cute. FYI, I bought this jacket (its reversible the plaid on one side the other is plain blue) for Damon at the Gap. I thought it was so cute way back when and would "visit" it until I got the price I wanted. All the boys have worn it. Aiden NEVER lets me take pictures of him. However, at the last football game he was wanting me to take pictures of him while he made a silly face. So I would snap a pic then have to show it to him and then he would make another silly face. And I know this is out of focus but I thought it still looked cool. 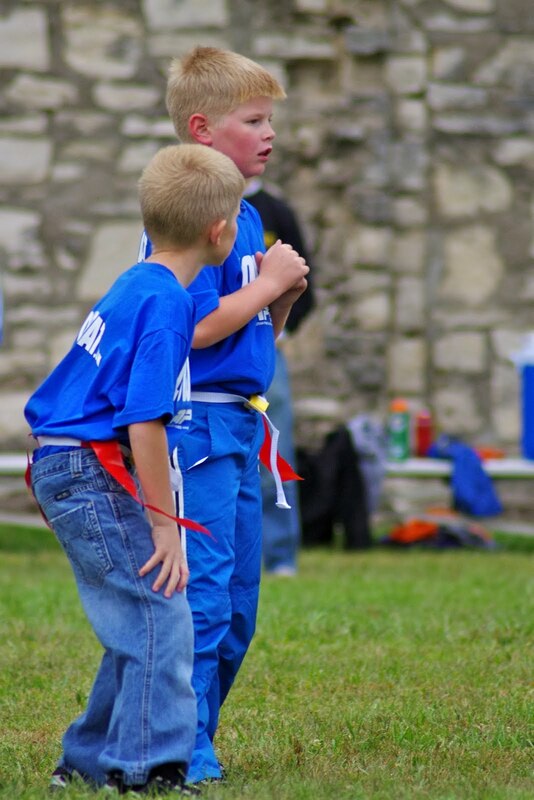 Damon and Xavier are playing flag football this fall. They are on the Cowboys (Boo! Hisss!) team. They have only played two games and haven't quite done as well as they have hoped (nice way of saying they have lost big time). But they are still having fun which is all we care about. The highlight of the first game, Xavier punted and kicked his shoe off. Guess what went farther then the ball? It was awesome. Do you see how crazy that Vikings player looks??? Thats one intense kid. When I was pregnant with Grayson, Damon always talked about how he and Grayson would be buddies. He has always felt that Aiden and Xavier wrestle around too much and he needed someone to fight against them. Saturday while we were celebrating Adam's birthday, Damon was laying on the floor and Xaiver and Aiden were tackling him. It made Grayson very upset, he was crying and trying to stop them. It really was so cute. Then a little bit later Grayson got in trouble for trying to unplug the fan. He crawled over to Damon and sat on his lap for some comfort. We had a little party at our house for Adam on Saturday evening. His parents and grandma came over for dinner and ice cream pie. He got some nice gifts and we had a good time with the family. Looks like we have another train addict on our hands. I know this picture is a little weird but Grayson does this really cute thing where he will come up and lay his head on your leg when he tired. Its just so sweet. Labor day was such a fun day for our family. We started the day by going to the bishopric breakfast bright and early (seriously they need to start considering brunch) for some yummy pancakes. The boys had a blast running around with all their friends. After we met up with some friends at Pott 2 to hang out at the lake with them. 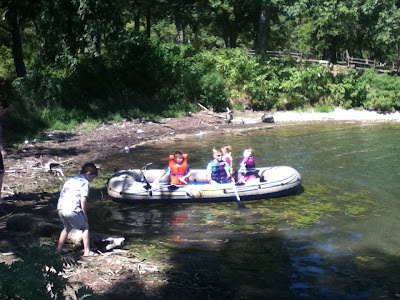 They had a boat/raft that the boys loved playing on. Then we just cooked hot dogs, ate potato chips, and roasted marshmallows. So we ate really healthy that day. 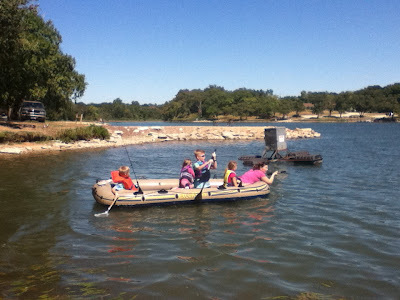 Kids in a boat...Damon really tried to row the thing but it was really hard for him. Vickie got in and took them for a ride. She may or may not have lost her shoes. Then Adam had to take a turn. Grayson was happy sitting on the side and eating dirt. He had a lot of it that day. After the lake we went home and took naps and then met up with some other friends for a potluck dinner. It was a fun day and the boys were TIRED when we got home. It was awesome! I should have posted this last week but it just didn't happen. Damon - He is pretty timid about trying new things but this summer he swam in the ocean (bogey boarded too and actually got too brave that he started scaring me), held an alligator and climbed a very high tower. He has also begun a sports craze by playing baseball, basketball and now football. Xavier - He was baptized this year right after his 8th birthday. He is sure growing up fast! My favorite story, we ran into a girl from his class. He has had her in 1st, 2nd and now 3rd grade. Her mom told me that she said Xavier was the nicest boy she had ever met. Grayson - Walking. He gets faster every day. Me - I finished the Chronicles of Narnia series. I know everyone else read them in Middle school but I don't really enjoy reading. And honestly, I couldn't tell you the last book I finished. I'm great at starting them but not so much for finishing. So big accomplishment for me! Adam - He ran a 40 mile trail race. And is getting ready to run a 50 mile something in October. But we all think he is crazy.